1. First and foremost, make sure you’re using the right CD tray card and booklet templates — and that the dimensions are precise, as this will save many headaches. 2. As with most graphic design work, set your files up in RGB for the initial design stages — and utilize the most appropriate colour profile for the job. 3. Make critical decisions about the actual CD Sleeve design print; if the client requires 2 spot colours, think about the Pantone Colours you’re going to use and how well the CMYK [final] imagery on the other files will match these colours (if a match is required). Also, if the CD design file colours are totally vector based from the start, use CMYK in this instance. 4. When working on your design, always remember to view it at 100%-size at regular intervals throughout the design process. This way, you will gain a good understanding of how the CD sleev will look when printed. Remember, album artwork is now commonly viewed on-screen in programs such as iTunes – and on iPod’s, etc — so it’s important to consider what it will look like when scaled down on-screen. For example, does the printed work contain special ‘out-of-gamut’ spot colours, foil block or 3D elements? If so, consider developing a scree-safe alternate version for online and mobile use. 5. I recommend that all text used is in vector-format so that is prints as clearly as possible — if this is desired. Also, try and use fonts that can be embedded into a PDF – additionally, it’s worth converting all your type to outlines in the closing stages of your design work so you don’t have any worries about sending a copy of your chosen font to the printers, where mistakes can be made. 7. If there’s one place on the CD design where text placement-accuracy is paramount — it’s on the tray card spines. On a standard jewel CD case template there’s barely a 1cm width to place a CD Title, Band Name, Record Company Logo and any other information that is required. My main advise here is not to utilize the full width of the spine, because depending on your printer, the text placement can easily get shunted left or right due to the inaccuracy of the printers’ guillotines. Remember, there should be a 3mm bleed on all your artwork (except CD Print), so strike a sensible balance of legibility of text and design-prudence. 9. Print out a hard-copy of your work on a good colour laser or ink-jet printer. Make sure that ’scale to fit page’ is not selected when you print, making sure you do it at 100% scale. Utilize your printer drivers’ advanced colour settings and use colour profiles for the best possible colour-match. Get out a metal ruler & scalpel or guillotine, cut out the booklet pages and tray card (making sure you trim the 3mm bleed) and physically insert the prints into the jewel case to make sure they fit and look as desired. Check the spine text/components and make sure your design looks as intended through the ‘clear’ jewel case – making sure your chosen colours don’t look washed out. 10. Finally, once all is good, save or export your work to PDF. When you save the files, be sure to include your chosen CMYK color profiles and take a look at the PDF summary before saving. A common summary warning is that some artwork hasn’t been flattened or that the document raster effects are set at 72 dpi, which is below print-standard (typically 300 dpi). It’s a good idea to save the PDF in the most current version, but spare a thought if you’re sending your files abroad to a ‘less-advanced’ or developing country, as they may be using outdated PDF readers. Question regarding Tip #2: why would files be set up initially in an RGB color space when the chances are high that final output will be in CMYK or Spot Colors? Color can look so different onscreen from the final printed output—what if the vibrant red the client expects won’t translate into a CMYK alternative? Just curious. Otherwise, I wholeheartedly agree with the remaining nine tips. After looking at steps 2 and 3 together, I can see how my brief summaries sound when read together, but it wasn’t my intention. Ill add an extra note on it, thanks. 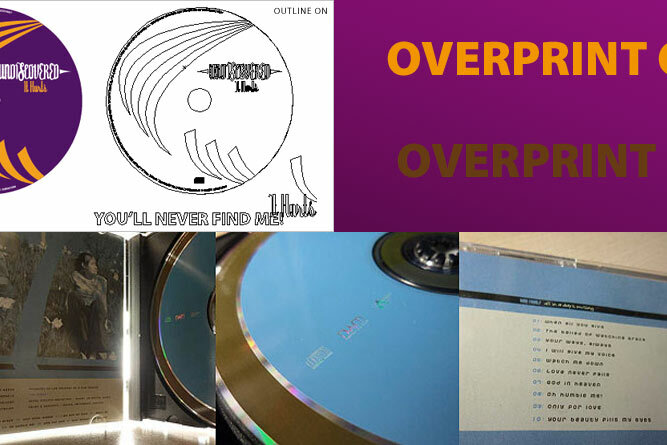 Setting files up in an RGB Color space is pretty much standard for most print work, including CD Cover art. The chances are not high that final output will be in CMYK — it ‘Will’ be CMYK if not Spot Color. Some CD Prints will be produced utilizing spot-color, but even so, a spot color photo in Photoshop, for example, would be set up as a Duo or Tri-tone from a Greystyle image — still not CMYK in development stages. The only time I would set a file up directly as CMYK is if all the work was vector based in Illustrator (and I wasn’t exporting the vectors into photoshop for further editing); subsequently denoting the Spot / Pantone® colors. In short, on-screen work should be in RGB, as RGB is your monitor color-mode. CMYK files are only converted prior to printing for necessity and color consistency after correct use of profiling imagery. I’m still not sure I get your reasoning for working in RGB initially if something is going to end up in CMYK anyway? I recently worked on a job that had a photo that my client had chosen which started in RGB and once it was in CMYK to do more editing to, the vibrant blues/greens that once were all became muted because CMYK just wasn’t quite able to hit the same intensity as RGB.. So why would you stick with RGB all the way through the process, through all your editing and colour treatments and so on, just to mute it and end up with a result that you weren’t working towards? The reason is quite simple. I’ll give you an example of what could occur if I designed in CMYK from the start. …I setup my files as CMYK with, say, a FOGRA 27 color profile. After spending 8 hours designing an 8-page gatefold design, the client supplies me with some more photo files to be used. As they originated from a digital camera, they are in RGB. I place them in layers in Photoshop and get to work. An hour later, I want to use certain filters on these layers — but I can’t, as many functions and filters are only available in RGB mode In PS. …My client also informs me that this CD cover is to be used in an interative digital booklet and used online in iTunes, etc. As the CMYK SWOP gamut is vastly smaller than the “Additive” RGB gamut, some color info will be lost on conversion to the “subtractive” CMYK one. In conclusion, I reckon it’s always easier to work in RGB in Photoshop. As you stated Alex, some colors may be lost when converting to CMYK, but that is what the “Preview in CMYK” option is for in PS, so you can keep track of desasterous results from any conversions. Good point about the file size and performance, that’s something I hadn’t thought about to be honest.. and the concern about the filters is one I agree with, another one I hadn’t thought about..
Because I’m a print person, I only think of that as being the final output, so working in RGB to that extent (except when filters are needed, but this is the kind of thing you know going into the job) seems a little odd to me, you know? I’d rather start with CMYK whenever needed, so that I know exactly what I’m working with along the way.. So really it depends on the job I guess.. I’ve recently been working on a Shakespeare play my work is putting on (I work at a University, so it’s not as odd as it sounds) with some students. the files required some pretty heavy manipulation and wasn’t the usual kind of airbrushing/colour correction type of work, so I happily started in RGB.. But, for my workflow, that was more of an exception than a rule.. I suppose it’s down to personal preference I suppose. For myself, I do quite a lot of Large-format print work (some of my latest works being 200cm x 160cm), so starting in RGB will always be my preferred option to keep a consistent workflow. But you’re also right, there’s nothing wrong with working straight from CMYK if that’s how you work and are comfortable with it. Yeah, there are limitations, but like you said, at least your color-control will be slightly better. Thanks for your thoughts. Hope the Shakespeare designs work out well for you. One last off-topic statement, for some reason, all comments on my blog are going straight to moderation, but I’m still looking into my WordPress code…somethings gone wrong I think, as my settings are OK.
Yeah, custom work is definitely more fun to do. I’m working on designs to be stuck on mobile filing cabinets at the moment believe it or not…printed on vinyl. Do you have to do anything special to have the print come out ok on vinyl? Ie. no full colour, nothing below 10pt? Funny you should mention that. The quote came back for Vinyl printing, and it was more than the client was willing to pay, so I’m doing some alternate designs printed on digital 250gsm glossy paper instead. I don’t think you have to do anything special, but I suppose the type-size minimum makes sense. As there was no Vector text in my own images, I never checked with the printers. I know Full color and spot color are still OK for some Vinyls…it just theres loads of different types for indoor and outdoor use. Alex, I think I’ve fixed the Comment Moderation issue. It seems the WordPress Plugin “WP Ajax Edit Comments” was the culprit. Very interesting post and discussion. I agree with you to start in RGB and convert to CMYK at the print stage. I must say that my knowledge on color profiles is really bad. I never use them. Can you tell me which you use and how you know when to use them? In a Nutshell, I normally use fogra 27 uncoated/coated for print, and just the bog standard RGB 2.1 for web. However, there are exceptions. I’ll not go into detail here, as I’m going to write a post about it soon… theres quite a bit to go through. One bit of advise though, don’t use the Generic CMYK profiles, as results can be unpredictable! Andrew, Thanks for this answer. I will use it next time. And I look forward to the post on profiles. BTW, I’m having trouble with comment moderation. All comments are going for approval. I thought I tracked down why, but to no avail. Have you had similar trouble of your WP blog? Oh well, the mystery continues. Everything is OK in settings, the ‘An administrator must always approve the comment’ boxes were the first thing I checked. I thought I solved the problem when I deactivated Ajax Edit comments. I did some test comments and everything was fine. Now, it’s gone pear-shaped again. I may try deactivating them one by one to find the culprit, starting with the one you mentioned. Thanks for the advise Rob. Generally you want to start in RGB—especially for photographs—because it’s a wider color gamut than CMYK (more colors possible). For comparision with something more familiar just think of ppi: you always start as large as possible and down sample, never the other way around. Sometimes I will start in CMYK in illustrator, though. I’ve had too many “surprises” when converting RGB -> CMYK there. It’s hard to say exactly which CMYK profile to go with because Europe and US have different standards. I use US Web Coated (SWOP). When in doubt, ask your printer! Sometimes they will give you specific profiles, too, but in order to use them effectively, you have to calibrate your monitor. Oh, and it’s always a great idea to use “Working CMYK” colors for color correcting in RGB (less of a scare when you switch to real CMYK). View>Proof Setup>Working CMYK, then View>Proof Colors. Thanks for some great advise Lauren, I definitely agree. I often take a look at how the CMYK proofing is going ― especially when it comes to deep purples and blues. Bright greens also fall out og gamut I’ve found. I noticed recently that my regular printer has a color print out that can be purchased to match colors to, so results will be more predictable. Hi there, just a question. You say when creating cover art for iTunes and others you use the RGB color space. Do you mean by that sRGB or an untagged RGB profile. Does not many readers as itunes and some web browsers attach sRGB automatically when reading an untagged RGB picture and with that changing the color dramatically? I was referring to RGB in a very general sense, so yeah, sRGB IEC61966-2.1 is the one to use for web, as it’s a slightly more compressed color profile than, say, Adobe RGB, which is really intended for image editing, etc. If web browsers attach sRGB automatically, there wouldn’t really be any color loss, as another RGB would probably have a larger gamut anyway. Hello, Andrew and congratulations for the very good article!!! If you had time could you please answer a question that bothers me many days now? Some locals rock bands, asked me to some changes and those covers to be for their upcoming CDs release. I heard that it must be in CMYK mode all the artworks for printing purposes. Do I open just my PSD and Image > Mode > From RGB to CMYK as it is, with my layers and their effects etc open? Or I flatten the layers and do that? Because, if I flatten it and moded it in CMYK I see no difference between the RGB version. Then I export it to TIFF and with what preferences? Can you advice me? I would be more thankful if you have the time to answer these questions! Best regards A. Sorry, but I am a little confused as to your question. However, I will try and offer some info which may answer it (as best I can). 1. I advise you start all work in RGB. 2. When you have done all you need to in RGB, save another version of the file(s) and convert to CMYK. 3. After all is finished, and the client requires changes to a particular layer, go back to the RGB version and start the re-saving process again. * When saving the CMYK TIFF files, I just stick to 8-bit files, making sure LZW in turned-on (check that the printer accepts LZW compressed files, they should now in 2009), make sure layers are flattened and that no alpha channels remain as they will add to the file size. I was reading the replies here and I may have a bit of help for those who have trouble with the RGB > CMYK convert because of the visible colour change. One way to make this less noticeable can be (in Photoshop) to convert RGB > LAB and then from there LAB > CMYK. Just something a teacher taught me at college and it seems to work pretty well. Thanks for the info. I must admit, I’ve only ever read about using LAB color, but never actually used it. This is something I will experiment with when I have chance. Thanks for your helpful comment and contributing to this article. Just thought I would chip in on the colour thing, It’s always best to work in Adobe RGB, or even better ProPhoto RGB, with images and then convert to specific colour profiles at the end of output, you never know when that web project turns into a print project and vice verser! It is also best to not use Image>Mode>RGB/CMYK etc, but to use Edit>Convert To Profile which gives you greater control of the conversion. Lab is great too, but best for beginning adjustments and final adjustments in my opinion. Also… do you have a template for a CD booklet? Alyssa → Any good printers should have them available to download free on their site. There’s so many to choose from, so there’s no point in providing one I have on file, as it will probably be the wrong one. casey → Well, Photoshop and Illustrator, but these programs are costly. Cheaper alternatives may from older versions of these programs (try eBay), or use free programs such as Avery – although I can’t vouch for this program; never used it.